This portable set lets you launch into the classic drinking game at parties, picnics, and tailgates. This portable set lets you launch into the classic drinking game at barbecues, tailgates, and beach parties without worrying about spills, losing the ball, or getting grass in your beer. 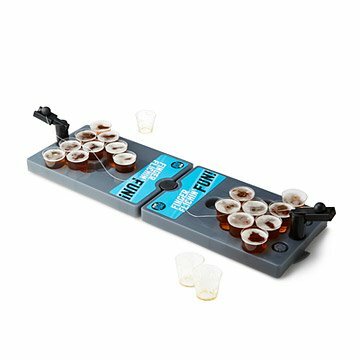 Start by filling the shot glass-sized cups and placing them on the no-tip slots in the game board (dishwasher friendly for easy clean up). Players take turns using built-in launchers to fling their ball towards the opposing team's cups. If your opponent's ball lands in one of your cups, you drink. A light nylon cord keeps the ball from rolling away in the event of a miss. The game ends when one side gets their ball into all of the other team's cups, or the board becomes too blurry to continue playing. Made in Minneapolis, Minnesota. Includes (50) 1 oz shot glasses. This gift was the best I could get my brother in law! We added our own spin on it and turned the "beer" into shots.... super easy to clean up & pack away. Now I want one for myself! I bought this for a party, and used it while people were waiting to play regs beer pong. Great to take on vacation. This was a great present since we went on vacation for my brother's birthday. However once opening the box, there was a lot of assembly required. Tying the nylon cord to the board and the ball was time consuming. Also the little rubber feet were very hard to put in the little holes so we ended up not using them. The board did move a little on the table but it was ok.